My name is Chris Hoffman and I live north of Bemidji, MN. I have a Masters degree in education and I work at Bemidji State University. 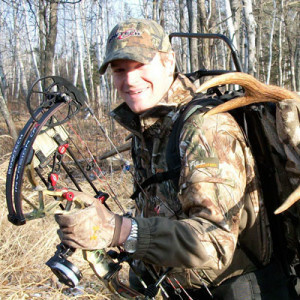 Growing up in northern Minnesota, I have the opportunity to hunt trophy big game in my back yard, but also enjoy hunting mule deer in the badlands or moose in the Canadian lake country. I live with my wife Stephanie, our son Henry, and our German Wirehair Lucy. I enjoy target shooting, but first and foremost I am a hunter. I need equipment that can stand up to abuse and maintain absolute precision. Thats why I shoot Bowtech.